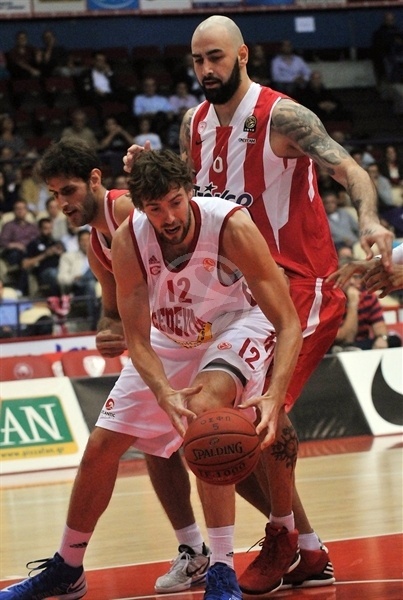 Olympiacos Piraeus held on for a tough 79-77 victory over Cedevita Zagreb Friday night at the Peace and Friendship Stadium. Vassilis Spanoulis starred early, Kyle Hines and Kostas Sloukas made the big plays late, while Cedevita controlled the middle of an action-packed clash. The result left the Reds tied for third place in Group C at 2-2, while Cedevita remained last with a 0-4 record. 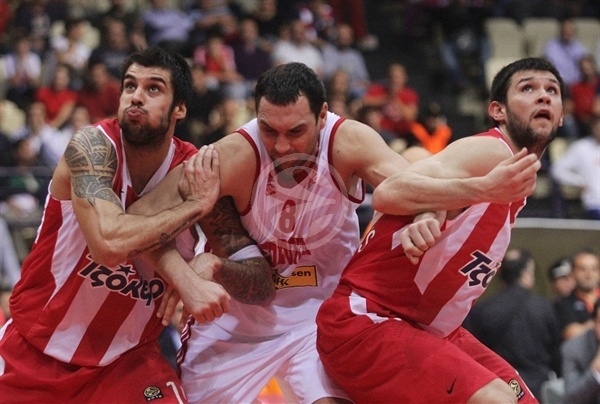 Spanoulis scored 14 points in a brilliant opening quarter as Olympiacos took charge. Cedevita rallied in the second quarter to briefly take the lead. Big men Miro Bilan and Luksa Andric fueled Cedevita to a 7-point lead early in the fourth quarter. 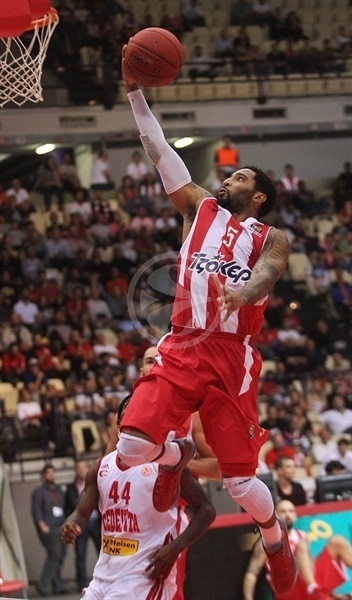 However Olympiacos fought back. The key play was Hines’s offensive rebound and assist to Sloukas for a three-point play that gave the hosts a 75-74 lead with 39.2 seconds left. Bracey Wright missed a floater with 12 seconds left and Sloukas ultimately iced the game from the line. Spanoulis finished with 21 points and 7 assists, while Kostas Papanikolaou added 14 points, Georgios Printezis netted 13, Sloukas 10 and Hines tallied 8 points, 7 rebounds, 6 assists and 3 blocks. 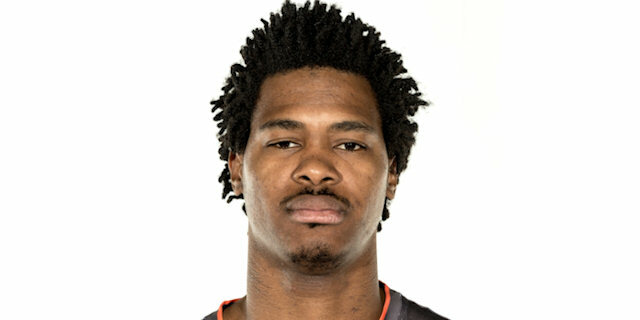 Bilan led Cedevita with 16 points and 7 rebounds, Andric scored 15 and Mickeal Gelabale 11. Olympiacos broke the ice as Spanoulis penetrated and kicked out to Papanikolaou for an open three-pointer. Predrag Suput scored Cedevita first point from the lien. A layup by Bracey Wright and a Bilan tip-in gave the visitors a 3-5 lead. Spanoulis reversed that with a big three-pointer. Spanoulis soon added a basket-plus foul to lift the hosts to 11-7. Bilan scored again on the offensive glass and Wright added a free throw to get the visitors within 1. Spanoulis continued his superb start by making it 13-10 through five minutes. 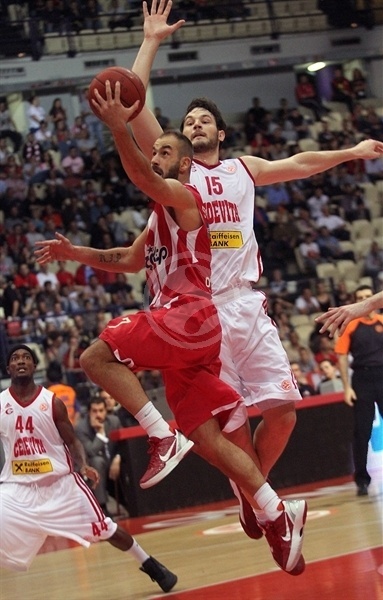 After Spanoulis reached 10 points with a pair of free throws, he drew a foul on defense. Spanoulis then stuck a jumper before Acie Law got a layup in transition to put the hosts up 7. 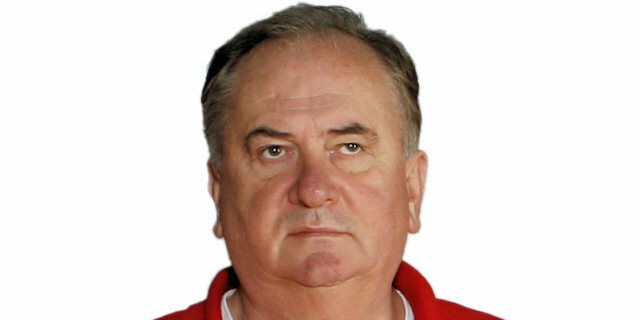 The Reds’ defense held Cedevita scoreless for nearly three minutes before Andric scored inside. Spanoulis took a rest after scoring 14 points in eight minutes. Kyle Hines brought about a round of sheers with a high-rising block, but Andric got to the line after for 2 free throws to keep his team within 22-16 at the end of the quarter. 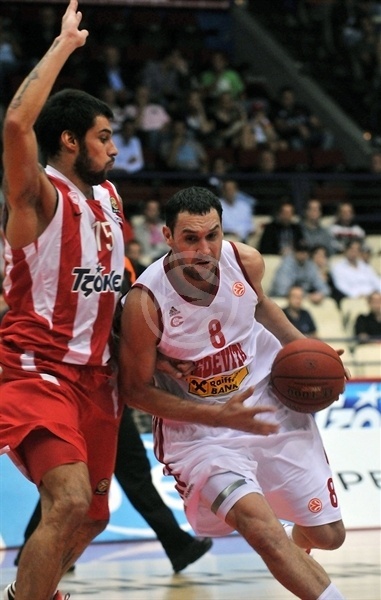 Andric remained hot with the first basket of the second quarter, but Kostas Sloukas matched him. The pace slowed a bit, but then Printezis wowed the fans as he took a pass from Hines and spun ender the rim for a layup and a 10-point Olympiacos lead. 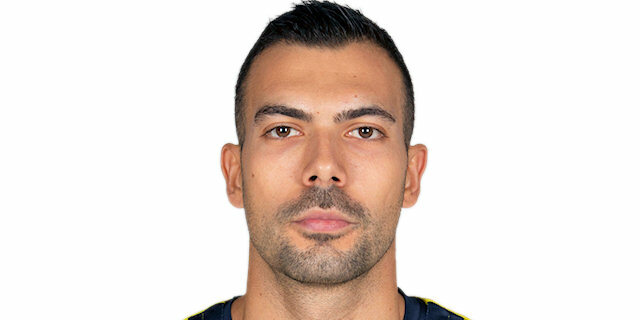 Vlado Ilievski netted 2 from the line for the visitors. Then Wright threaded the needle with a bounce pass to Andric for a layup to trim the deficit to 6. Law answered right back with a triple, but Gelabale and Wright each scored in rapid succession to make it 31-26 midway through the second quarter. Andric then drilled a three from the corner as the visitors continued an impressive push. Ilievski fed Andrid to tie the game at 31-31 and even a timeout didn’t cool Cedevita off. Bilan capped a 3-15 run to give the visitors the lead. Papanikolaou got the Reds back on top with a pretty basket-plus-foul off an inbounds pass from Spanoulis. Papanikolaou extended the lead with free throws. Bilan rose high for a tip-in. but 2 more Papanikolaou free throws and a steal that led to a Spanoulis jumper at the buzzer made it 42-35 at the break. Marques Green opened the second half with a three in transition and Wrigth finished a nice passing move with an assist to Andric for a slam to bring the visitors within 2. 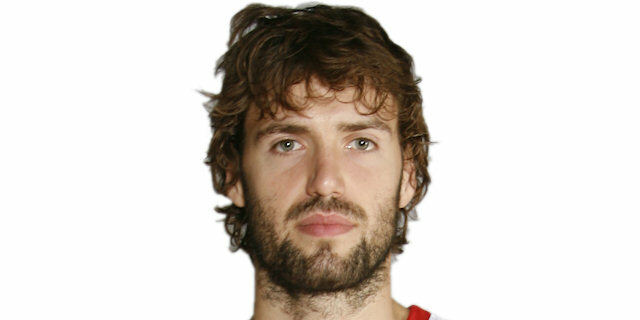 Printezis sank a three-pointer to keep the Reds ahead. Cedevita missed one two consecutive quick trips down the floor with a chance to possible tie it. Instead Hines’s offensive rebound, basket and foul made it 48-42 midway through the second quarter. Green kept Cedevita in the running with a triple and Gelabale soon added a long two-pointer to make it 49-47. Stratos Perperoglou converted 2 from the line for the Reds; Bilan did the same for Cedevita. Evangelos Mantzaris knocked down a big three to make it 54-49. Bilan scored down low, but Hines muscled his way to a basket that left the hosts up 56-53 at the end of the quarter. Marko Car scored his first basket of the night before Suput nailed a triple to put Cedevita ahead. Green nailed his third three of the night as Peace and Friendship Stadium fell silent at 56-61. Hines woke the fans up with a layup-plus-foul. Bilan answered with 2 free throws. Wright’s pull-up jumper gave the visitors a 7-point cushion. 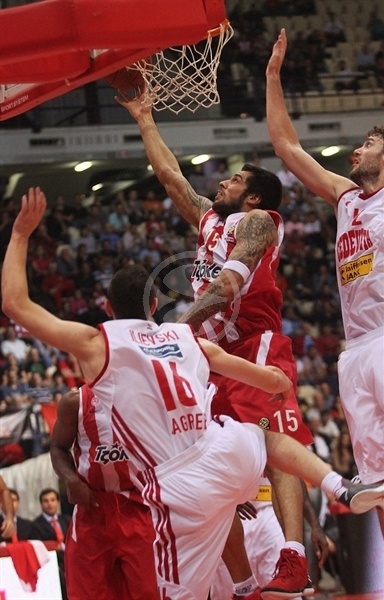 Just as things looked most bleak for the hosts, Spanoulis came alive with a big triple. And soon Sloukas drilled a triple to make 64-65 midway through the fourth. 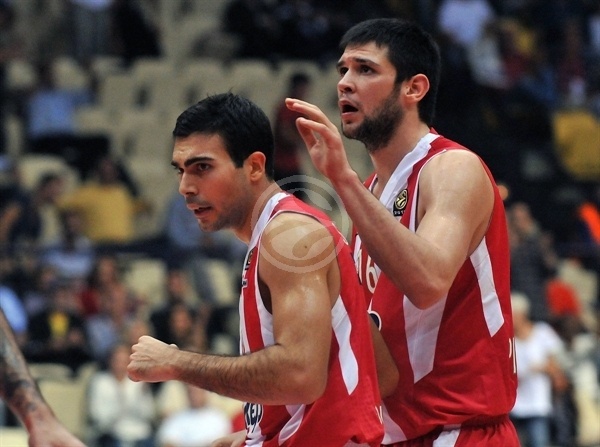 Gelabale answered from downtown, but Spanoulis drew his 12th foul and scored his 20th and 21st points. An offensive foul on Andric meant his game was over with four minutes to go. 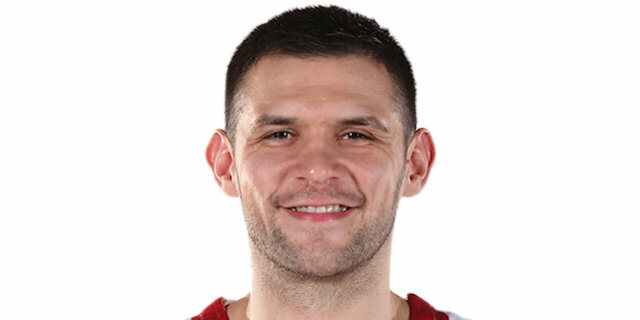 Papanikolaou got to the line and evened the score at 68-68. Defenses took a turn to shine as Hines and Goran Suton each blocked shots. Spanoulis assisted Printezis for an alley-oop lay-in, but Suton scored quickly to make it 70-70 with two minutes remaining. Gelabale put Cedevita ahead, Hines’s tip-in made it 72-72. Gelabale fed Suton to put Cedevita ahead one more. Printezis missed a three, but Hines battles for the offensive rebound and while falling out of bounds, passed between Gelebale’s legs to Sloukas who scored and was fouled by Gelabale – his fifth! After Sloukas made the free throw, it was 75-74 with 39.2 seconds left. With the crowd on its collective feet, Wrigth wound the clock down and went up for a floater with 12 seconds left, but came up short. He immediately fouled Papanikolaou, who nailed both free throws with 11.6 seconds to go. The Reds sent Suton to the line, setting up a free throw competition for the finish. Suton made the first, missed the second on purpose and got to the rebound, but it hit his knee and rolled out of bounds. Sloukas iced the win with 2 free throws with 5.7 seconds left. "We had to win in order to stay alive in the competition and everybody understands the pressure on the whole team. Our players, Spanoulis, Antic, Printezis, Perperoglou missed open shots and that was a problem. We fought for every possession and we grabbed 18 offensive boards. Cedevita played good inside defense and allowed us some shots from the perimeter and while we were missing the shots, they gained more confidence. In the end we beat them, despite the pressure and I would like to thank our fans for their support. Every victory is important and we don’t underestimate it. I hope that we will deal with the pressure and we will play our game soon. Josh Powell is coming and he will help us find the balance we need. It is important to play better defense and to forget that we are the reigning Euroleague champions." "This loss is like a victory for us, because until the last second we troubled the current Euroleague champions. We played a quality game. Our main problem was Olympiacos getting 18 offensive rebounds, even though we tried and wanted to prevent that. But this loss gives us assurance that we are working and practicing well. After a while, we finally have all the players healthy, even though Ilievski had a high temperature before the game, and we cannot wait for Marko Tomas to come back. He is a very important player as he possess what we don’t have right now, an ability to drive to the basket and toughness to defend. No one likes to lose, but this loss makes us optimistic before the games to come." 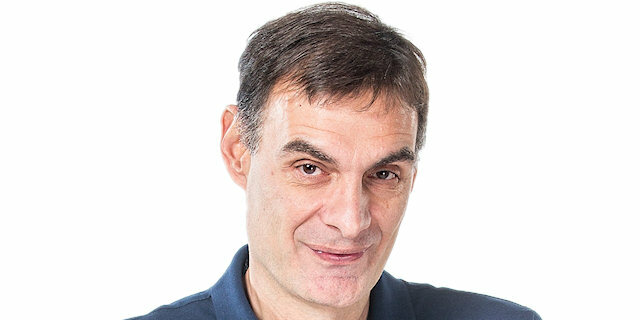 "After we lost to Anadolu Efes and Zalgiris, every game is like a final. Yes we are under pressure and we have to deal with it. The victory is important and must make us happy, but from the other side we are not satisfied by our performance. Tonight we made some bad offensive decisions and we made lots of mistakes in defense, which allowed our opponents to score layups and especially for their big men to make easy baskets. We have to watch the video and try hard in order to improve our game." "In the final minutes, the defense of Cedevita tried to stop Vassilis [Spanoulis], so I took the ball and fortunately I made some important points. I was feeling good and I made the free throws we needed. We play under pressure, there is no doubt. Cedevita came here to play their game and since we didn't control the boards and the rhythm of the game, they achieved their goal." "This is the best game we played in the Euroleague so far. Playing like this against the last year’s Turkish Airlines Euroleague champions will give us more confidence for the next Adriatic League and Euroleague games. If we compete like this every game, we will be close or win all of them." "We played a great game for 40 minutes, but in the end we didn’t have luck. Cedevita is a good team and we showed our value against the Euroelague champions. I think that the 0-4 current record is not fair and we will prove it in the near future."